*Place the island and whirlpool tiles according to the image above. Make sure that the Treasure Depot and the Islands are all facing North. The maps directional coordinate system is based on the treasure depot. Players select a player piece and place the piece on one of the docks (looks like a ladder) on Treasure Depot square. There can ONLY be one player piece per dock. Shuffle the treasure cards. 2 Treasure cards are placed on Island A and Island C, 4 Treasure cards are placed on Island B and Island D with the treasure cards faced down. Placed the cargo hold next to the game board area. Shuffle the Event cards and place the deck face down next to the cargo hold. When the Event Card deck runs out, shuffle the event card discard pile and place the deck face down next to the cargo hold. The youngest player goes first and the play go clockwise. For more advanced players, islands can be placed anywhere, however there can only be 1 island in every column and every row not including the Treasure Depot Row and Column (See default board arrangement above). The goal is to collect the most valuable assortment of treasure. Players dock at. The treasure islands to collect treasure, but must then return back to the treasure depot with their booty to claim it. When any one player deposits 3 pieces of treasure back at the Treasure Depot, every other play takes one more turn and then the treasure score is tallied. The player with the highest treasure score wins. 1: At the start of a player’s turn they draw an event card and follow the directions on that card. 2: A player rolls the 6 sided movement die and moves as many spaces as indicated on the die (1,2,3,4). A player can only move horizontally and vertically, not diagonally. Players can also move, Pac-Man style, from one edge of the board to the other. The players do not have to use all of the movement points rewarded by the roll. 3: To collect a treasure, a player must dock with an island. If a player docks with an island to collect a treasure, their turn is over. Whenever a play docks, they immediately draw a treasure card (including when they swap with a player – one of the event cards). A player does not need to land on an island with an exact roll. A player can only dock on an island if they approach an empty dock (i.e., a player may only dock at a North-facing dock in they are approaching from the North) . 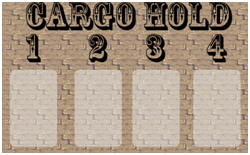 2b: If a player collects a treasure, it goes into the cargo hold with the treasure card face down until the player can deposit it back at the Treasure Depot. A player can only have ONE treasure in the cargo hold at a time. When the player picks up a treasure card from an island, it is not revealed to the other players until the end of the game. 2c: If a player docks at the Treasure Depot, their turn is over and they collect their treasure from the Cargo Hold. Docking: To enter a dock, a player must approach from the square adjacent to that dock (i.e., a player cannot use the North-facing dock if approach from the West.). Whirlpool: If a player passes through or lands on a whirlpool, they are transported to the other whirlpool. This counts as one space. If a player ends their turn on a whirlpool, and the whirlpool is moved, the player does NOT move with the whirlpool. A movement point is counted when entering and exiting a whirlpool. NOT when the player is transported between the two. Currents: Currents block movement. Players may not pass into an eastwards flowing current going west or vice-versa. The same goes for North & South flowing currents. A movement point is counted when you enter the current but not exiting the current. Currents always move the player to the nearest square following the flow the current (i.e., players cannot remain on a current square). Once every player has moved, any player rolls the green A-F dice twice. Players then swap those two islands. For example, if over the course of 2 rolls a player rolls “C” and “A”, those two islands change position but keep their rotation. Once the islands move, play proceeds back to Phase 1. Islands: All islands have at least 1 dock. A player must end a turn in a dock to collect a treasure. Only one player may occupy a dock at a time. To enter a dock, a player must approach from the square adjacent to that dock (i.e., a player cannot use the North-facing dock if approach from the West.). If an island is moved, any players docked at that island move with it. Reverse Turn Order: Island movement phase occurs with the last player of the round (the player before the player who drew the reverse turn order event card). Strong Winds: When a player gets a strong winds event card and move towards a current, the current overrides the strong wind event card until the player exits the current, then the strong winds reactivates. When a player is docked not in a direction of strong winds, the player undocks first then the movement is controlled by strong winds.